Ken can hit some opponents up into the air with a Light Punch Shoryuken and follow up with another one right afterward to juggle. Here's who this works against and where. Ken's most popular Super Art is his Shippuu-Jinrai-Kyaku, SA3. It offers the most EX meter, it's easy to combo into, and great for hit confirmations. Ken can follow up with another SA3 if his first one is blocked. The advantage here is that because of the invincibility window, your Super Art 3 may blow through your opponent's counter attack as they attempt to punish you. Some moves will still beat out a follow up SA3 though, especially if your opponent pulls out a Reversal Super. The timing to pull off another SA3 after the first one is blocked — leaving almost no open window — is fairly strict and it costs you an additional Super bar. But not only can you avoid being punished, you can also land a full Super on your opponent in the process, if they attempt to counter attack. This is a handy tactic and it can make your enemy more cautious when thinking about punishing this move. 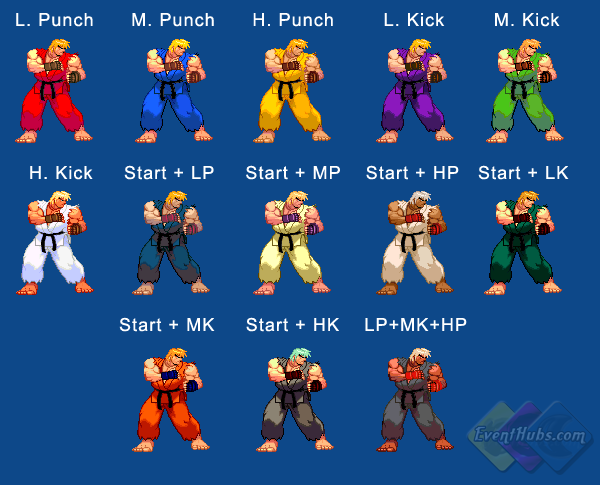 One of Ken's core combos. Easy to do, once you practice the timing for a bit. Old school combo that still works in this game as well. Scores a lot of hits and is solid if you don't have a full Super meter to launch a bigger combo. 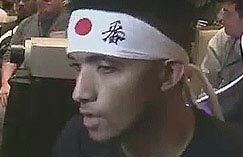 Note, the last hit will only connect against opponents that can be juggled with two consecutive Light Shoryuken attacks (see section above). This does a lot of damage if you fully connect with everything. While you can use the Hard and EX-Shoryuken for the final hit, they tend to miss their initial attack, so Medium Shoryukens work better here for damage. These combos work with all three of Ken's Super Arts. A great way to hit confirm your Super Art 3 attack. You can add in a jump in attack at the start of this combo as well. Great combo because you can go right into your Super Art 3 even if you land your Crouching Medium Kick from max range. This lets you punish things that would normally be outside the range of your other attacks. Only works if the Back + Medium Kick Overhead attack hits a crouching enemy, if so you can Link into your Super Art 3 for a nice combo. Timing on this is difficult though. Guide heavily edited by TJ369. Losha said on June 3, 2010 at 4:09 p.m. Agreed, very very dead, sadly. DANgerous said on February 18, 2011 at 3:07 p.m.
ima revive this 3rd strike blog! anyone who look at this please respond.